Taken at the Hannibal Caveman vs Terre Haute Rex (Prospect League) baseball game in Hannibal, Missouri. 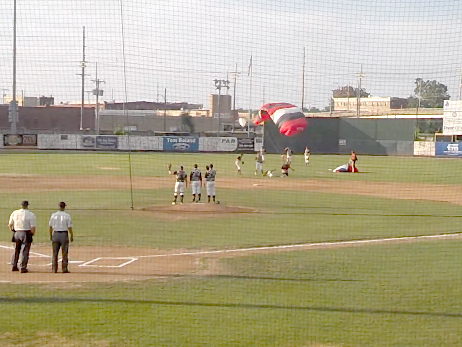 3 skydivers were part of the pre-game ceremonies. After the first one landed, I decided to video the next one which took out the player. The 3rd one landed just fine. Please note, the baseball player was okay and stayed in the game. We're all so glad to hear that the player managed to play through the pain and prove himself a real "sport" after the unfortunate incident. And thank you so much for sharing this rather surreal pre-game stunt gone awry with the Internet and all of us here at The Feed, sbjones20061!